Our client came to us with a photo of a beautiful mid-century sideboard designed by Erik Worts and produced by IKEA in Sweden in the 1960's. The dimensions of the piece didn't suit, and the sideboard was in an auction house in Sweden, so we were commissioned to make a custom reproduction of sorts adding our own design touches but keeping to the spirit of the original. 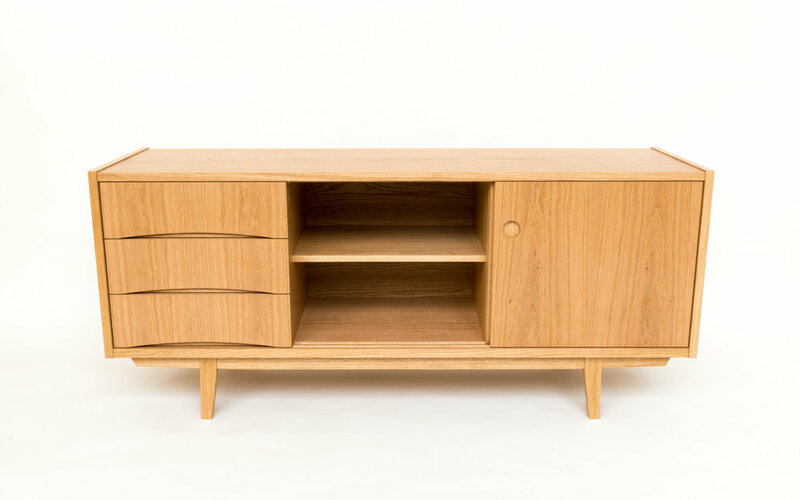 The leg frame of this piece is solid European oak, whilst the cabinet itself is constructed from custom veneered panels. The beautiful book matched oak veneers were hand picked and pressed onto solid lipped MDF. The doors and solid oak dovetailed drawer boxes run on hardwood glides.